The first table that follows lists the commands that can be executed on the ICM command line; the second table lists the options that can be included with them. Both tables include links to relevant text. Each of the commands is covered in detail in the “Using ICM” chapter. Command-line options can be used either to provide required or optional arguments to commands (for example, icm exec -interactive) or to set field values, overriding ICM defaults or settings in the configuration files (for example, icm run -namespace "MIRROR1"). The command table does not list every option that can be used with each command, and the option table does not list every command that can include each option. Use of the -verbose option, which is intended for debugging purposes only, may expose the value of iscPassword and other sensitive information, such as DockerPassword. When you use this option, you must either use the -force option as well or confirm that you want to use verbose mode before continuing. This section described the types of nodes that can be provisioned and deployed by ICM and their possible roles in the deployed InterSystems IRIS configuration. A provisioned node’s type is determined by the Role field. The following table summarizes the detailed node type descriptions that follow it. The node hosting the shard master is called the shard master data server. A shard master data server can be mirrored by deploying two nodes of role DM and specifying mirroring. The InterSystems IRIS Management Portal is typically accessed on the shard master data server; ICM provides a link to the portal on this node at the end of the deployment phase. If multiple nodes of role AM and a DM node (nonmirrored or mirrored) are specified without any nodes of role DS (shard data server), they are deployed as an InterSystems IRIS distributed cache cluster, with the former serving as application servers and the latter as an data server. Finally, a node of role DM (nonmirrored or mirrored) deployed by itself becomes a standalone InterSystems IRIS instance. When included in a sharded cluster, shard master application servers provide application access to the sharded data, distributing the user load across multiple nodes just as application servers in a distributed cache cluster do. If the shard master data server is mirrored, two or more shard master application servers must be included. SQL and InterSystems IRIS ObjectScript commands that can be issued against the shard master data server (using the icm sql and icm session commands) can be issued against any of the shard master application servers. Shard master application servers automatically redirect application connections when a mirrored shard master data server fails over. If multiple nodes of role AM and a DM node are specified without any nodes of role DS (shard data server), they are deployed as an InterSystems IRIS distributed cache cluster, with the former serving as application servers and the latter as an data server. When the data server is mirrored, application connection redirection following failover is automatic. A data shard stores one horizontal partition of each sharded table loaded into a sharded cluster. A node hosting a data shard is called a shard data server. A cluster can have two or more shard data servers up to over 200. Shard data servers can be mirrored by deploying an even number and specifying mirroring. Query shards provides query access to the data shards to which they are assigned, minimizing interference between query and data ingestion workloads and increasing the bandwidth of a sharded cluster for high volume multiuser query workloads. A node hosting a query shard is called a shard query server. If shard data servers are deployed they are assigned round-robin to the deployed shard data servers. Shard query servers automatically redirect application connections when a mirrored shard data server fails over. When a shard master data server, a distributed cache cluster data server, a stand-alone InterSystems IRIS instance, or shard data servers are mirrored, deployment of an arbiter node to facilitate automatic failover is highly recommended. One arbiter node is sufficient for all of the mirrors in a cluster; multiple arbiters are not supported and are ignored by ICM, as are arbiter nodes in a nonmirrored cluster. The AR node does not contain an InterSystems IRIS instance, using a different image to run an ISCAgent container. This arbiter image must be specified using the DockerImage field in the definitions file entry for the AR node; for more information, see The icm run Command. For more information about the arbiter, see the “Mirroring” chapter of the High Availability Guide. For a custom load balancer, additional parameters must be provided. For nodes of role LB, ICM configures the ports and protocols to be forwarded as well as the corresponding health checks. Queries can be executed against the deployed load balancer the same way one would against a shard master application server or distributed cache cluster application server. Queries against this cluster can be executed against the load balancer the same way they would be against the AM nodes servers. Currently, a single automatically provisioned load balancer cannot serve multiple node types (for example, both web servers and application servers), so each requires its own load balancer. This does not preclude the user from manually creating a custom load balancer for the desired roles. More information about these keys can be found in ICM Configuration Parameters. A load balancer does not require (or allow) an explicit entry in the definitions file. Some cloud providers create a DNS name for the load balancer that resolves to multiple IP addresses; for this reason, the value displayed by the provider interface as DNS Name should be used. If a numeric IP address appears in the DNS Name column, it simply means that the given cloud provider assigns a unique IP address to their load balancer, but doesn't give it a DNS name. Because the DNS name may not indicate to which resources a given load balancer applies, the values displayed under IP Address are used for this purpose. For providers VMware and PreExisting, you may wish to deploy a custom or third-party load balancer. A cluster may contain any number of web servers. Each web server node contains an InterSystems Web Gateway installation along with an Apache web server. ICM populates the remote server list in the InterSystems Web Gateway with all of the available AM nodes (shard master application servers or distributed cache cluster application servers). If no AM nodes are available, it instead uses the DM node (shard master data server or distributed cache cluster data server); if mirrored, a mirror-aware connection is created. Finally, communication between the web server and remote servers is configured to run in SSL/TLS mode. The AlternativeServers field determines how the Web Gateway distributes requests to its target server pool. Valid values are LoadBalancing (the default) and FailOver. This field has no effect if the ApplicationPath field is not specified. For information about using the InterSystems Web Gateway, see the Web Gateway Configuration Guide. A cluster may contain any number of virtual machine nodes. A virtual machine node provides a means of allocating compute instances which do not have a predefined role within an InterSystems IRIS cluster. Docker is not installed on these nodes, though users are free to deploy whatever custom or third-party software (including Docker) they wish. A load balancer may be assigned to a VM node; see Role LB: Load Balancer. A cluster may contain any number of container nodes. A container node is a general purpose node with Docker installed. You can deploy any custom and third-party containers you wish on a CN node, except InterSystems IRIS containers, which will not be deployed if specified. All ICM commands are supported for container nodes, but most will be filtered out unless they use the -container option to specify a container other than iris, or the either the -role or -machine option is used to limit the command to CN nodes (see ICM Commands and Options). A load balancer may be assigned to a CN node; see Role LB: Load Balancer. Container nodes are used in distributed management mode. ICM validates the node definitions in the definitions file to ensure they meet certain requirements; there are additional rules for mirrored configurations. Bear in mind that this validation does not include configurations that are not functionally optimal, for example a single AM node, a single WS, 10 DS with only one QS node or vice-versa, and so on. In both nonmirrored and mirrored configurations, QS nodes are assigned to DS nodes in round-robin fashion. If AM and WS nodes are not both included, they are all bound to the DM; if they are both included, AM nodes are bound to the DM and WS nodes to the AM nodes. When the Mirror field is set to False in the defaults file (the default), mirroring is never configured, and provisioning fails if more than one DM node is specified in the definitions file. If two DM nodes are specified in the definitions file, they are configured as a mirror failover pair using the default MirrorMap value, primary,backup. The number of DM nodes can also be less than the number of elements in MirrorMap; in the example above, changing Count to 2 would deploy a primary and backup, while making it 3 would deploy the failover pair and one async. All asyncs deployed by ICM are DR asyncs; reporting asyncs are not supported. Up to 14 asyncs can be included in a mirror. For information on mirror members and possible configurations, see Mirror Components in the “Mirroring” chapter of the High Availability Guide. If one DM is specified, provisioning fails. If an even number of DS nodes is specified, they are configured as mirror failover pairs, for example specifying six DS nodes deploys three mirrored shard data servers. Async members are not supported for DS mirrors. If an odd number of DS nodes is specified, provisioning fails. If more than one AR (arbiter) node is specified, provisioning fails. To see the mirror member status of each node in a configuration when mirroring is enabled, use the icm ps command. There is no relationship between the order in which DM or DS nodes are provisioned or configured and their roles in a mirror. You can determine which member of each pair is the primary failover member and which the backup using the icm inventory command, the output of which indicates each primary with a + (plus) and each backup with a - (minus). The relationships between these nodes are pictured in the following illustration. The sharding manager, which handles communication between the shard master data server and the shard data servers in a basic cluster, enables direct connections between the shard master application servers and the shard query servers in this more complex configuration. For detailed information about connections within a sharded cluster, see the chapter “Horizontally Scaling InterSystems IRIS for Data Volume with Sharding” in the Scalability Guide. Two DM (shard master data server, distributed cache cluster data server, standalone InterSystems IRIS instance) or more, if DR asyncs are specified by the MirrorMap field. This release of InterSystems IRIS does not support the use of async members in mirrors serving as shard master data server or shard data server nodes in sharded clusters. A mirrored DM node that is deployed in the cloud without AM nodes must have some appropriate mechanism for redirecting application connections; see Redirecting Application Connections Following Failover or Disaster Recovery in the Mirroring chapter of the High Availability Guide for more information. Mirroring is enabled by setting key Mirror in your defaults.json file to True. MirrorMap can be used in conjunction with the Zone and ZoneMap fields to deploy async instances across zones; see Deploying Across Multiple Zones. Remote database bindings are assigned in the same fashion as a non-mirrored cluster, however the targets are mirrored pairs rather than individual servers. Automatic LB deployment (see Role LB: Load Balancer) is supported for providers Amazon AWS, Microsoft Azure, and Google Cloud Platform; when creating your own load balancer, the pool of IP addresses to include are those of all AM and WS nodes. ICM must be able to format, partition, and mount volumes designated for use by InterSystems IRIS and Docker. The former are mounted by whatever InterSystems IRIS container is currently running on the host machine, with names determined by the fields DataDeviceName, WIJDeviceName, Journal1DeviceName, and Journal2DeviceName. The DockerDeviceName field specifies the name of the device mounted for use by Docker. For all providers other than type PreExisting, ICM attempts to assign reasonable defaults (see Device Name Parameters), but these values are highly platform and OS-specific and may need to be overridden in your defaults.json file. For PreExisting deployments, see Storage Volumes in the “Deploying on a Preexisting Cluster” appendix. InterSystems IRIS instances deployed in containers require licenses just as do noncontainerized instances. General InterSystems IRIS license elements and procedures are discussed in the “Licensing” chapter of the System Administration Guide. The needed license keys are staged in a directory within the ICM container, or on a mounted volume, that is specified by the LicenseDir fields in the defaults.json file, for example /Samples/License. ICM configures a license server on the DM node (or nodes, if mirrored), which serves the specified licenses to the InterSystems IRIS nodes (including itself) during deployment. All nodes in a sharded cluster require a sharding license. When deployed in nonsharded configurations, a standard license is sufficient for DM and AM nodes. No license is required for AR, LB, WS, VM, and CN nodes; if included in the definition for one of these, the LicenseKey field is ignored. For information about the ICM fields used to specify the files needed for the security described here, see Security-Related Parameters. This is the host machine on which containers are deployed. It may be virtual or physical, running in the cloud or on-premises. ICM uses SSH to log into compute nodes and remotely execute commands on them, and SCP to copy files between the ICM container and a compute node. To enable this secure communication, you must provide an SSH public/private key pair and specify these keys in the defaults.json file as SSHPublicKey and SSHPrivateKey. During the configuration phase, ICM disables password login on each compute node, copies the private key to the node, and opens port 22, enabling clients with the corresponding public key to use SSH and SCP to connect to the node. Other ports opened on the host machine are covered in the sections that follow. During provisioning, ICM downloads and installs a specific version of Docker from the official Docker web site using a GPG fingerprint. ICM then copies the TLS certificates you provide (located in the directory specified by the TLSKeyDir field in the defaults file) to the host machine, starts the Docker daemon with TLS enabled, and opens port 2376. At this point clients with the corresponding certificates can issue Docker commands to the host machine. During provisioning, ICM launches Weave Net with options to encrypt traffic and require a password (provided by the user) from each machine joining the Weave network. ICM deploys Weave Scope with authentication enabled; credentials must be provided in the defaults.json file. For more information, see Monitoring in ICM. For detailed and comprehensive information about InterSystems IRIS security, see the InterSystems IRIS Security Administration Guide. ICM expects that the InterSystems IRIS image was installed with Normal security (as opposed to Minimal or Locked Down). To secure the InterSystems IRIS instance, the default password for predefined accounts must be changed by ICM. The first time ICM runs the InterSystems IRIS container, passwords on all enabled accounts with non-null roles are changed to a password provided by the user. If you don’t want the InterSystems IRIS password to appear in the definitions files, or in your command-line history using the -iscPassword option, you can omit both; ICM interactively prompts for the password, masking your typing. Because passwords are persisted, they are not changed when the InterSystems IRIS container is restarted or upgraded. ICM opens JDBC connections to InterSystems IRIS in SSL/TLS mode (as required by InterSystems IRIS), using the files located in the directory specified by the TLSKeyDir field in the defaults file. ICM creates mirrors (both DM pairs and DS failover pairs) with SSL/TLS enabled (see the Mirroring" chapter of the High Availability Guide), using the files located in the directory specified by the TLSKeyDir field in the defaults file. Failover members can join a mirror only if SSL/TLS enabled. ICM configures WS nodes to communicate with DM and AM nodes using SSL/TLS, using the files located in the directory specified by the TLSKeyDir field in the defaults file. InterSystems recommends the use of an LDAP server to implement centralized security across the nodes of a sharded cluster or other ICM deployment. For information about using LDAP with InterSystems IRIS, see the “Using LDAP” chapter of the Security Administration Guide. Some cloud providers allow their virtual networks to span multiple zones within a given region. 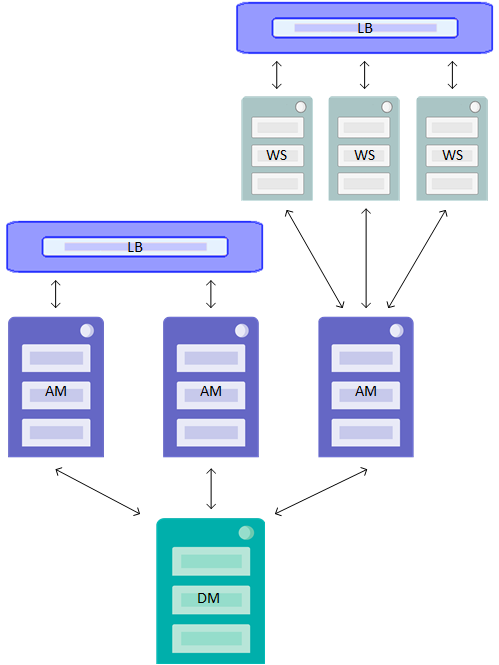 For some deployments, you may want to take advantage of this to deploy different nodes in different zones, For example, if you deploy a DM mirror that includes a failover pair and two DR asyncs (see Mirrored Configuration Requirements), you can accomplish the cloud equivalent of putting physical DR asyncs in remote data centers by deploying the failover pair, the first async, and the second async in three different zones. The specified zones are assigned to nodes in round-robin fashion. For example, if you use the first example and provision four DS nodes, the first and third will be provisioned in us-west-1b, the second and fourth in us-west-1c. 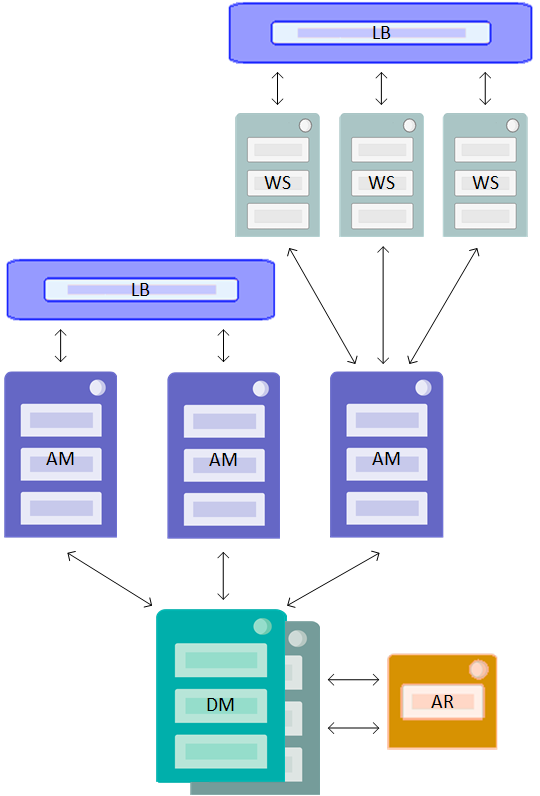 This places the primary and backup mirror members in us-west-1a and one application server in each zone, while the asyncs are in different zones from the failover pair to maximize their availability if needed  the first in us-west-1b and the second in us-west-1c. The arbiter node does not need a ZoneMap field to be placed in us-west-1a with the failover pair; round-robin distribution will take care of that. ICM offers Weave Scope, a product of Weaveworks, as a basic monitoring facility. Weave Scope is not deployed by default, but must be specified in the defaults file using the Monitor field. The proxy configures HTTPS to use the SSL keys located in the directory specified by the TLSKeyDir parameter and carries out authentication using the MonitorUsername and MonitorPassword parameters. The Weave Scope UI is available at all node IP addresses, not just the one listed. Fully-qualified domain names may not work with unsigned certificates, in which case use the IP address instead. When an error occurs during an ICM operation, ICM displays a message directing you to the log file in which information about the error can be found. Before beginning an ICM deployment, familiarize yourself with the log files and their locations as described in Log Files and Other ICM Files. In addition to the topics that follow, please see Additional Docker/InterSystems IRIS Considerations in Running InterSystems IRIS in Containers for information about important considerations when creating and running InterSystems IRIS images container images. When a cloud compute node is shut down and restarted due to an unplanned outage or to planned action by the cloud provider (for example, for preventive maintenance) or user (for example, to reduce costs), its IP address and domain name may change, causing problems for both ICM and deployed applications (including InterSystems IRIS). The AWS Elastic IP feature preserves IP addresses and domain names across compute node restarts. ICM disables this feature by default is because it incurs additional charges on stopped machines (but not running ones), and because AWS allows only five Elastic IP addresses per region (or VPC) unless a request is made to increase this limit. To enable this feature, set the ElasticIP field to True in your defaults.json file. For more information on this feature, see Elastic IP Addresses in the AWS documentation. $ icm ssh -command "weave connect --replace 54.191.233.2"
When the target system is under extreme load, various operations in ICM may time out. Many of these timeouts are not under direct ICM control (for example, from cloud providers); other operations are retried several times, for example SSH and JDBC connections. java.io.IOException: com.jcraft.jsch.JSchException: channel is not opened. In this case the recommended course of action is to retry the operation (after identifying and resolving its proximate cause). For container networking, Docker uses a bridge network (see Use bridge networks in the Docker documentation) on subnet 172.17.0.0/16 by default. If this subnet is already in use on your network, collisions may occur that prevent Docker from starting up or prevent you from being able to reach your deployed compute nodes. This problem can arise on the machine hosting your ICM container, your InterSystems IRIS cluster nodes, or both. If the problem arises with the ICM container, edit the file /etc/docker/daemon.json on the container’s host. If the problem arises with the compute nodes in a deployed configuration, edit the file /ICM/etc/toHost/daemon.json in the ICM container; by default this file contains the value in the preceding example, which is likely to avoid problems with any deployment type except PreExisting. Detailed information about the contents of the daemon.json file can be found in Daemon configuration file in the Docker documentation; see also Configure and troubleshoot the Docker daemon. ERROR: Default --ipalloc-range 10.32.0.0/12 overlaps with existing route on host. You must pick another range and set it on all hosts. 1 Insufficient privileges to allocate Huge Pages; non-root instance requires CAP_IPC_LOCK capability for Huge Pages. These tables describe the fields you can include in the configuration files (see Configuration, State and Log Files) to provide ICM with the information it needs to execute provisioning and deployment tasks and management commands. LicenseDir Location of InterSystems IRIS license keys staged in the ICM container and individually specified by the LicenseKey field (below); see InterSystems IRIS Licensing for ICM. LicenseKey License key for the InterSystems IRIS instance on one or more provisioned DM, AM, DS, or QS nodes, staged within the ICM container in the location specified by the LicenseDir field (above). ISCPassword Password that will be set for the _SYSTEM, Admin, and SuperUser accounts on the InterSystems IRIS instances on one or more provisioned nodes. Corresponding command-line option: -iscPassword. DockerImage Docker image to be used for icm run and icm pull commands. Must include the repository name. Corresponding command-line option: -image. DockerRegistry DNS name of the server hosting the Docker repository storing the image specified by DockerImage. If not included, ICM uses Docker’s public registry located at registry-1.docker.io. DockerUsername Username to use for Docker login to the respository specified in DockerImage on the registry specified by DockerRegistry. Not required for public repositories. If not included and the repository specified by DockerImage is private, login fails. DockerVersion Version of Docker installed on provisioned nodes. Default is ce-18.03.1.ce. The Docker images from InterSystems optionally deployed by ICM comply with the OCI support specification, and are supported on Enterprise Edition and Community Edition 18.03 and later. Docker Enterprise Edition only is supported for production environments. Not all combinations of platform and Docker version are supported by Docker; for detailed information from Docker on compatibility, see the Compatibility Matrix and About Docker CE. URL of the Docker Enterprise Edition repository associated with your subscription or trial; when provided, triggers installation of Docker Enterprise Edition on provisioned nodes, instead of Docker Community Edition. DockerStorageDriver Determines the storage driver used by Docker. Values include overlay2 and devicemapper (the default). If DockerStorageDriver is set to overlay2, the FileSystem parameter must be set to xfs. If DockerStorageDriver is set to overlay2, the DockerDeviceName parameter (see Device Name Parameters) must be set to null. Home Root of the home directory on a provisioned node. Default: /home. Mirror If True, InterSystems IRIS instances are deployed with mirroring enabled; see Mirrored Configuration Requirements. Default: False. If True, and the spark image is specified by the DockerImage field, Spark is deployed with InterSystems IRIS in the iris container (see The icm run Command for more information). Default: false. LoadBalancer Set to True in definitions of node type AM, WS, VM, or CN for automatic provisioning of load balancer on providers AWS, GCP, and Azure. Default: false. Namespace Namespace to be created during deployment. The namespace specified is also set as the default namespace for the icm session and icm sql commands. The predefined namespace USER may be used in nonmirrored deployments only. For more information, see The Definitions File. Default: USER. Command-line option: -namespace. Routine cache allocation from system memory. See routines in the Parameter File Reference and Memory and Startup Settings in the Configuring InterSystems IRIS chapter of the System Administration Guide. Default: 0 (automatic allocation). Size of the generic memory heap (in KB). See gmheap in the Parameter File Reference and gmheap in the “Advanced Memory Settings” section of the Additional Configuration Settings Reference. . Default: 37568. Maximum size of shared memory for locks (in bytes). See locksiz in the Parameter File Reference. Default: 16777216. Maximum memory per process (KB). See bbsiz in the Parameter File Reference. Default: 262144. Enable/disable locking shared memory or the text segment into memory. See memlock in the Parameter File Reference. Default: 0. Overlay Determines the Docker overlay network type; normally "weave", but may be set to "host" for development or debug purposes, or when deploying on a preexisting cluster. Default: weave (host when deploying on a preexisting cluster). ISCAgentPort Port used by InterSystems IRIS ISC Agent. Default: 2188. JDBCGatewayPort * Port used by InterSystems IRIS JDBC Gateway. Default: 62972. SuperServerPort * Port used by InterSystems IRIS Superserver. Default: 51773. WebServerPort * Port used by InterSystems IRIS Web Server (Management Portal). Default: 52773. Port used by InterSystems IRIS License Server. Default: 4002. SparkMasterPort Port used by Spark Master. Default: 7077. SparkWorkerPort Port used by Spark Worker. Default: 7000. SparkMasterWebUIPort Port used by Spark Master Web UI. Default: 8080. SparkWorkerWebUIPort Port used by Spark Worker Web UI. Default: 8081. SparkRESTPort Port used for Spark REST API. Default: 6066. Port used for Spark Driver. Default: 7001. Port used for Spark Block Manager. Default: 7005. Count Number of nodes to provision from a given entry in the definitions file. Default: 1. Label Name shared by all nodes in this deployment, for example ACME; cannot contain dashes. Role Role of the node or nodes to be provisioned by a given entry in the definitions file, for example DM or DS; see ICM Node Types. Tag Additional name used to differentiate between deployments, for example TEST; cannot contain dashes. StartCount Numbering start for a particular node definition in the definitions file. For example, if the DS node definition includes "StartCount": "3", the first DS node provisioned is named Label-DS-Tag-0002. Type of file system to use for persistent volumes. Valid values are ext2, ext3, ext4, xfs, and btrfs. Default: xfs. See the DockerStorageDriver parameter for restrictions. Number of Consul servers to deploy in distributed management mode. Valid values are 0, 1, 3, and 5. Default: 0. Application path to create for definitions of type WS. Default: none. Remote server selection algorithm for definitions of type WS. Valid values are LoadBalancing and FailOver. Default: LoadBalancing. The location on the compute instance where the persistent volume described by DataDeviceName (see Device Name Parameters) will be mounted. Default: /irissys/data. The location on the compute instance where the persistent volume described by WIJDeviceName (see Device Name Parameters) will be mounted. Default: /irissys/wij. The location on the compute instance where the persistent volume described by Journal1DeviceName (see Device Name Parameters) will be mounted. Default: /irissys/journal1j. The location on the compute instance where the persistent volume described by Journal2DeviceName (see Device Name Parameters) will be mounted. Default: /irissys/journal2j. OSVolumeSize Size (in GB) of the OS volume to create for deployments other than type PreExisting. Default: 32. In some cases, this setting must be greater than or equal to a value specific to the OS image template or snapshot; for more information, see Creating a Virtual Machine from a Template in the Terraform documentation.. Size (in GB) of the block storage device used for the Docker thin pool for providers other than PreExisting. This volume corresponds to the DockerDeviceName parameter (see Device Name Parameters) . Default: 10. DataVolumeSize Size (in GB) of the persistent data volume to create for deployments other than type PreExisting. This volume corresponds to the DataDeviceName parameter (see Device Name Parameters) and will be mounted at DataMountPoint. Default: 10. WIJVolumeSize Size (in GB) of the persistent WIJ volume to create for deployments other than PreExisting. This volume corresponds to the WIJDeviceName parameter (see Device Name Parameters) and will be mounted at WIJMountPoint. Default: 10. Journal1VolumeSize Size (in GB) of the persistent Journal volume to create for deployments other than type PreExisting. This volume corresponds to the Journal1DeviceName parameter (see Device Name Parameters) and will be mounted at Journal1MountPoint. Default: 10. Journal2VolumeSize Size (in GB) of the alternate persistent Journal volume to create for deployments other than type PreExisting. This volume corresponds to the Journal2DeviceName parameter (see Device Name Parameters) and will be mounted at Journal2MountPoint. Default: 10. SystemMode String to be shown in the Management Portal masthead. Certain values (LIVE, TEST, FAILOVER, DEVELOPMENT) trigger additional changes in appearance. Default: blank. Provider Platform to provision infrastructure on; see Provisioning Platforms. Default: none. Monitor Deploy Weave Scope for basic monitoring by sepcifying the value scope. Default: none. Username to use in authenticating to Weave Scope. Default: none. Password to use in authenticating to Weave Scope. Default: none. Docker image used to provide authentication and HTTPS for Weave Scope monitoring. The LicenseServerPort field appears in the [LicenseServers] block of the iris.cpf file, bound to the name of the configured license server (see InterSystems IRIS Licensing for ICM). The parameters in the following table are used to identify files and information required for ICM to communicate securely with the provisioned nodes and deployed containers. For information about using scripts provided with ICM to generate these files, see Obtain Security-Related Files in this document. For information about how ICM uses the security files you provide to communicate securely with provisioned nodes and services on them, see ICM Security. For general information about using the SSH protocol, see SSH PROTOCOL from SSH Communications Security. For information about using SSL/TLS with Docker, see Protect the Docker daemon socket in the Docker documentation. For general information about using SSL/TLS with InterSystems IRIS, see Using SSL/TLS with InterSystems IRIS and The InterSystems Public Key Infrastructure in the Security Administration Guide. For information about the contents of the file identified by the SSLConfig parameter, see Creating a Client Configuration in the same document. For information about the use of SSL/TLS to secure connections between mirror members, see Securing Mirror Communication with SSL/TLS Security in the High Availability Guide. SSHPassword Initial password for the user specified by SSHUser. Required for marketplace Docker images and deployments of type vSphere, Azure, and PreExisting. This is used only during provisiong, at the conclusion of which password logins are disabled. SSHOnly If True, ICM does not attempt SSH password logins during provisioning (providers PreExisting and vSphere only). Default: False. SSHPublicKey Public key of SSH public/private key pair; required for all deployments. SSLConfig Path to an SSL/TLS configuration file used to establish secure JDBC connections. Default: If this parameter is not provided, ICM looks for a configuration file in /TLSKeyDir/SSLConfig.Properties (see previous entry). Some of the parameters listed are used with more than one provider. Cloud providers operate data centers in various regions of the world, so one of the important things to customize for your deployment is the region in which your cluster will be deployed. Another choice is which virtual machine images to use for the computes nodes in your cluster. Although the sample configuration files define valid regions and machine images for all cloud providers, you will generally want to change the region to match your own location. Because machine images are often specific to a region, both must be selected. At this release, ICM supports provisioning of and deployment on compute nodes running Red Hat Enterprise Linux, version 7.2 or later, so the machine images you select must run this operating system. SSHUser Nonroot account with sudo access used by ICM for access to provisioned nodes (see Security-Related Parameters). Root of SSHUser’s home directory can be specified using the Home field. Required value is determined by the selected AMI; for Red Hat Enterprise Linux images, the required value of SSHUser is usually ec2-user. AMI AMI to use for a node or nodes to be provisioned; see http://docs.aws.amazon.com/AWSEC2/latest/UserGuide/AMIs.html. Example: ami-a540a5e1. Region Region to use for a node or nodes to be provisioned; see https://docs.aws.amazon.com/AWSEC2/latest/UserGuide/using-regions-availability-zones.html. Example: us-west-1. Zone Availability zone to use for a node or nodes to be provisioned; see link in previous entry. Example: us-west-1c. For information on using this field with multiple zones, see Deploying Across Multiple Zones. When multiple zones are specified, specifies which nodes are deployed in which zones. Default: 0,1,2,...,255. For information on using this field with multiple zones, see Deploying Across Multiple Zones. ElasticIP Enables the Elastic IP feature to preserve IP address and domain name across compute node restart; for more information, see AWS Elastic IP Feature. Default: False. InstanceType Instance Type to use for a node or nodes to be provisioned; see https://aws.amazon.com/ec2/instance-types/. Example: m4.large. Existing Virtual Private Cloud (VPC) to be used in the deployment, instead of allocating a new one; the specified VPC is not deallocated during unprovision. If not specified, a new VPC is allocated for the deployment and deallocated during unprovision. Internal parameter net_subnet_cidr must be provided if the VPC is not created in the default address space 10.0.0.0/16; for example, for a VPC in the range 172.17.0.0/16, you would need to specify net_subnet_cidr as 172.17.%d.0/24. OSVolumeType Determines maximum OSVolumeSize. See http://docs.aws.amazon.com/cli/latest/reference/ec2/create-volume.html. Default: standard. IOPS count for OSVolume. Must be nonzero for volumes of type iops. Default: 0. Determines maximum DockerVolumeSize (see OSVolumeType). Default: standard. IOPS count for DockerVolume. Must be nonzero for volumes of type iops. Default: 0. DataVolumeType Determines maximum DataVolumeSize (see OSVolumeType). Default: standard. IOPS count for DataVolume. Must be nonzero for volumes of type iops. Default: 0. WIJVolumeType Determines maximum WIJVolumeSize (see OSVolumeType). Default: standard. IOPS count for WIJVolume. Must be nonzero for volumes of type iops. Default: 0. Journal1VolumeType Determines maximum Journal1VolumeSize (see OSVolumeType). Default: standard. IOPS count for Journal1Volume. Must be nonzero for volumes of type iops. Default: 0. Journal2VolumeType Determines maximum Journal2VolumeSize (see OSVolumeType). Default: standard. IOPS count for Journal2Volume. Must be nonzero for volumes of type iops. Default: 0. MachineType Machine type resource to use for a node or nodes to be provisioned. See https://cloud.google.com/compute/docs/machine-types. Example: n1-standard-1. Region Region to use for a node or nodes to be provisioned; see https://cloud.google.com/compute/docs/regions-zones/regions-zones. Example: us-east1. Zone Zone in which to locate a node or nodes to be provisioned. Example: us-east1-b. For information on using this field with multiple zones, see Deploying Across Multiple Zones. Image The source image from which to create this disk. See https://cloud.google.com/compute/docs/images. Example: centos-cloud/centos-7-v20160803. OSVolumeType Determines disk type for the OS volume. See https://cloud.google.com/compute/docs/reference/beta/instances/attachDisk. Default: pd-standard. Determines disk type for the Docker block storage device (see OSVolumeType). Default: pd-standard. DataVolumeType Determines disk type for the persistent Data volume (see OSVolumeType). Default: pd-standard. WIJVolumeType Determines disk type for the persistent WIJ volume (see OSVolumeType). Default: pd-standard. Journal1VolumeType Determines disk type for the persistent Journal1 volume (see OSVolumeType). Default: pd-standard. Journal2VolumeType Determines disk type for the persistent Journal1 volume (see OSVolumeType). Default: pd-standard. Size The size of a node or nodes to be provisioned; see https://docs.microsoft.com/en-us/azure/virtual-machines/virtual-machines-windows-sizes. Example: Standard_DS1. Location Location in which to provision a node or nodes; see https://azure.microsoft.com/en-us/regions/. Example: Central US. Zone Zone in which to locate a node or nodes to be provisioned. Possible values are 1, 2, and 3. SubscriptionId Credentials which uniquely identify the Microsoft Azure subscription. ClientSecret Provides access to an Azure application. TenantId Azure Active Directory tenant identifier. PublisherName Entity providing a given Azure image. Example: OpenLogic. Offer Operating system of a given Azure image. Example: Centos. Sku Major version of the operating system of a given Azure image. Example: 7.2. Version Build version of a given Azure image. Example: 7.2.20170105. Account tier, either HDD (Standard) or SSD (Premium). Account storage type: locally-redundant storage (LRS), geo-redundant storage (GRS), zone-redundant storage (ZRS), or read access geo-redundant storage (RAGRS). Existing Resource Group to be used in the deployment, instead of allocating a new one; the specified group is not deallocated during unprovision. If not specified, a new Resource Group is allocated for the deployment and deallocated during unprovision. Existing Virtual Network to be used in the deployment, instead of allocating a new one; the specified network is not deallocated during unprovision. If not specified, a new Virtual Network is allocated for the deployment and deallocated during unprovision. Internal parameter net_subnet_cidr must be provided if the network is not created in the default address space 10.0.%d.0/24. When True, authenticates using a Managed Service Identity in place of ClientId and ClientSecret. Requires that ICM be run from a machine in Azure. Server Name of the vCenter server. Example: tbdvcenter.iscinternal.com. Datacenter Name of the datacenter. VsphereUser Username for vSphere operations. VspherePassword Password for vSphere operations. VCPU Number of CPUs in a node or nodes to be provisioned. Example: 2. Memory Amount of memory (in MB) in a node or nodes to be provisioned. Example: 4096. Collection of datastores where virtual machine files will be stored. Example: DatastoreCluster1. Guest ID for the operating system type. See Enum - VirtualMachineGuestOsIdentifier on the VMware support website. Default: centos64Guest. Time (in minutes) to wait for an available IP address on a virtual machine. Default: 5. Time (in minutes) to wait for graceful guest shutdown when making necessary updates to a virtual machine. Default: 3. Time (in minutes) to wait for virtual machine migration to complete. Default: 10. Time (in minutes) to wait for virtual machine cloning to complete. Default: 30. Time (in minutes) that Terraform waits for customization to complete. Default: 10. Name of a vSphere resource pool. Example: ResourcePool1. If specified, determines whether Storage DRS is enabled for a virtual machine; otherwise, use current datastore cluster settings. Default: Current datastore cluster settings. If specified, determines Storage DRS automation level for a virtual machine; otherwise, use current datastore cluster settings. V;ues are automated or manual. Default: Current datastore cluster settings. True  All disks for this virtual machine will be kept on the same datastore. False  Storage DRS may locate individual disks on different datastores if it helps satisfy cluster requirements. Default: Current datastore cluster settings. Number of SCSI controllers for a given compute instance; must be between 1 and 4. The OS volume is always be placed on the first SCSI controller. vSphere may not be able to create more SCSI controllers than were present in the template specified by the Template field. SCSI controller on which to place the Docker volume. Must be between 1 and 4 and may not exceed SCSIControllerCount. SCSI controller on which to place the Data volume. Must be between 1 and 4 and may not exceed SCSIControllerCount. SCSI controller on which to place the WIJ volume. Must be between 1 and 4 and may not exceed SCSIControllerCount. SCSI controller on which to place the Journal1 volume. Must be between 1 and 4 and may not exceed SCSIControllerCount. SCSI controller on which to place the Journal2 volume. Must be between 1 and 4 and may not exceed SCSIControllerCount. The requirements for the VMware vSphere template are similar to those described in Compute Node Requirements for preexisting clusters (for example, passwordless sudo access). To address the needs of the many users who rely on VMware vSphere, it is supported by this release of ICM. Depending on your particular vSphere configuration and underlying hardware platform, the use of ICM to provision virtual machines may entail additional extensions and adjustments not covered in this guide, especially for larger and more complex deployments, and may not be suitable for production use. Full support is expected in a later release. IPAddress This is a required field (in the definitions file) for provider PreExisting and is a generated field for all other providers. DNSName FQDN of the compute instance, or its IP Address if unavailable. Deployments of type PreExisting may populate this field (in the definitions file) to provide names for display by the icm inventory command. This is a generated field for all other providers. The parameters in the following table specify the devices (under /dev) on which persistent volumes appear (see Storage Volumes Mounted by ICM). Defaults are available for all providers other than PreExisting, but these values are highly platform and OS-specific and may need to be overridden in your defaults.json file. For PreExisting deployments, see Storage Volumes in the “Deploying on a Preexisting Cluster” appendix. For restrictions on DockerDeviceName, see the DockerStorageDriver parameter (see General Parameters). These parameters are generated by ICM during provisioning, configuration, and deployment. They should generally be treated as read-only and are included here for information purposes only. Generated by executing weave dns-args on the compute instance. List of IP addresses of every compute instance except the current on. Password used to encrypt traffic over Weave Net; disable encryption by setting to the literal "null" in the defaults.json file. Location on the ICM client where temporary, state, and log files will be written. Default: ICM-nnnnnnnnn. Command-line option: -stateDir. Assigns an index to each object in the definitions.json file; this is used to uniquely number load balancer instances (which would otherwise have the same names). The role associated with the resources being managed by a given load balancer. Name assigned to a failover mirror. Total number of instances in this deployment.